There’s always an excuse: your legs hurt, or you have too much work to do, or there’s a great show on television. The reasons for sitting and not moving about are endless- and so are the risks to your health and well-being. As newly published guidelines from The Department of Health and Human Services make clear, nearly 80% of us don’t move enough in our lives and it’s costing our health care system nearly $117 billion in extra health care costs as a result. So how do you get up off the couch and keep yourself moving? As you’ll find from listening to this report on NPR, the amount of movement required to improve your health and well-being is not outrageous- and it doesn’t need to be done at one time or even in a formal way at a gym. 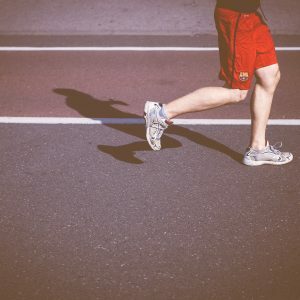 As the guidelines make clear, ”everything counts”- whether it’s taking the stairs instead of the elevator, walking around the block a few different times a day, or doing window shopping at the local mall- whatever you do, you just need to be conscious that you’re never sitting for too long and hopefully engaging in moderate activity at least 22 minutes a day. For older adults, the suggestion is to combine moving with strengthening exercises and balance activities to prevent falls. For ideas about enhancing your strength if you’re over age 50, pick up some barbells and read here. And for some additional suggestions for fitting in fitness if you think you’re too busy, consider buying that treadmill desk and start reading here and here.